I am getting ready to move my family across the country back to Florida. Let me tell you, the best stress reliever for me is to sit down after a hard day of wrangling packing and look at ideas for my new home office! In this tiny house my office is the front room right after you walk in the front door and there is really NO ROOM for anything beyond my desk area. But I have vowed (like Scarlet O’hara) to never be hungry again… okay maybe not that dramatic, but I have said that whatever house my hubs picks out I have to have an area where I can have an office/craft room/photography studio. It doesn’t have to be a formal “room-room” but it can’t be the foyer either! 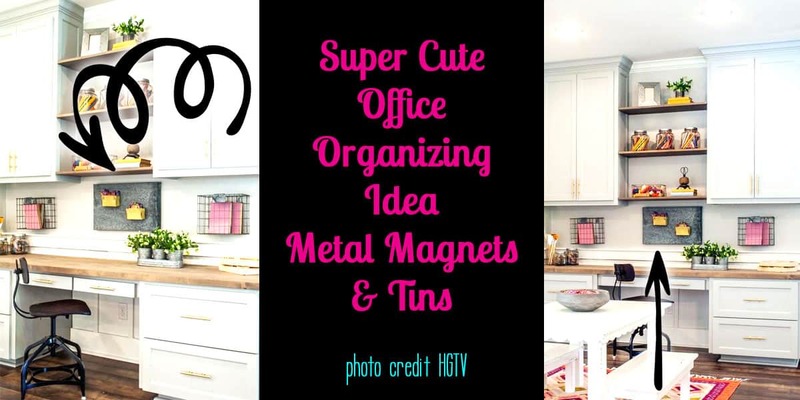 So this idea of using magnet organizers came to me when I was watching direct TV and and Joanna Gaines did a one minute “organizing kids rooms” spot. In it she showed for two seconds these cute little yellow metal boxes that she has hanging on a piece of metal. That lead me on a two hour search to find a picture of said boxes and (finally) I found them! The reason I love this is three fold…. First, it looks functional and colorful and like something I could actually do. 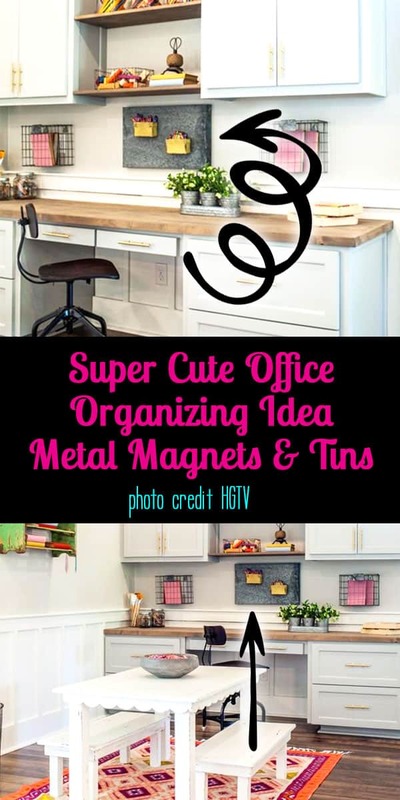 I could hang a piece of metal by my desk easily and then just have all kinds of cute sticky-on metal containers. Second, I HAVE to have things visible or they are not actually real. Organizing your office and having it look like something cute instead of a giant jumbled mess is a challenge when you are visually oriented like I am. Now I can’t really justify buying it right now and moving it across country, but I did want to make sure that I would be able to find it when the time came! For the actual holders I think I want authentic old containers so I will be heading out to antique stores in search of something cute. Thank goodness I adopted my children and my youngest was 5 when we got him, as my house is FULL of things covered in old lead paint for sure!